Grout is a tricky to keep clean because it is porous. And on tile floors, crumbs and dirt can be left behind, even after sweeping. Plus, a quick wipe of the tiled surface can sometimes miss spots because the grout lines are often slightly deeper than the surface. To clean stained grout, use a strong bleach solution (3/4 cup of bleach to 1 gallon of water) and scrub with a small brush or toothbrush. Don't scrub too hard, though; you might damage the grout. Wear safety goggles to prevent the bleach from spattering in your eyes. Keep the work area ventilated. Or try a foaming grout cleaner that might need to soak for several minutes to be effective. 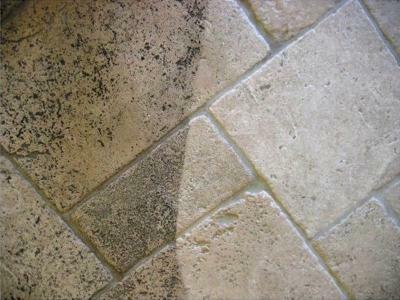 If grout is deeply stained and discolored, replace it. Tile stores sell and sometimes rent tools for removing grout. Run the tool along the grout, taking care not to scratch the surrounding tile. Clean the space between the tiles with a strong bleach solution, then apply new grout and seal it. Do NOT spill bleach on porcelain because the solution might cause pitting or yellow or pink stains. Because grout is so porous and prone to collecting grime, you'll want to start your grout-cleaning regimen with prevention. If you recently installed new grout or renewed existing grout in a tile floor, keep that new grout looking its best by using a grout sealer 10-14 days after the grout.